One of my all time absolute favorite restaurants in Mill Valley is The Buckeye Roadhouse. I go there a couple times a week for both lunch and dinner. I crave their Ahi Tuna Salad and must have it minimum once a week. One night friends were common over and so I decided to try and recreate it. 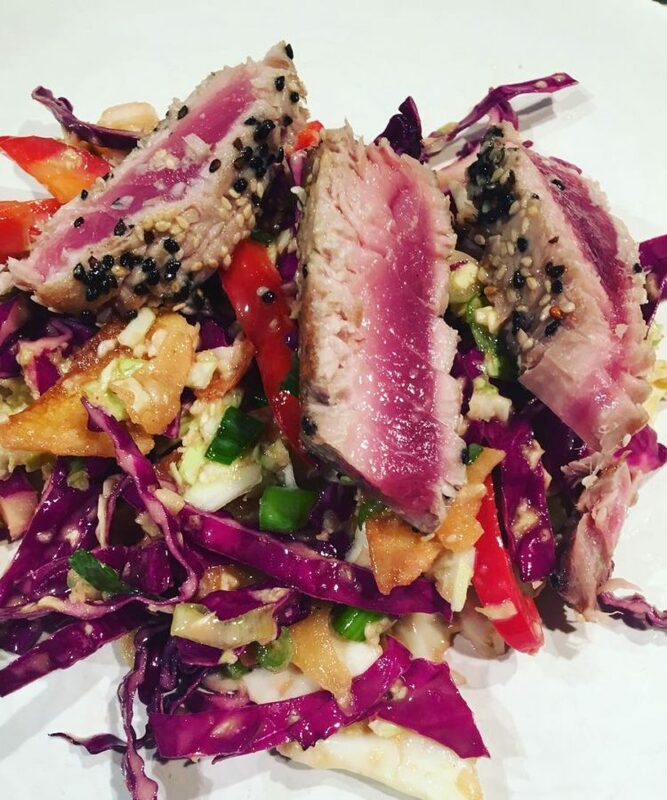 The ingredients are fairly simple: red and green cabbage, scallions, crispy fried wontons, strips of raw red peppers black & white sesame seeds, pickled ginger and seared Ahi Tuna. For the dressing I used Rice Wine vinegar, Soy Sauce, Sesame oil a little sugar and sricha and…a dab of mayonnaise! My friends that I was cooing for were highly skeptical of this move. Highly skeptical.. So I set out to make it. My 1st setback came when the grocery store had no WonTons to fry. Hmmmm…..but they did have Lasagne noodles. Ok that’ll do. 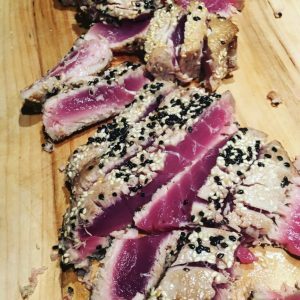 Next I found a beautiful piece of tuna gathered up the rest of my ingredients and went home to see what would happen. Well I have to say it was amazing!! Nothing short of fabulous! It is probably a very different dressing than what The Buckeye uses but the flavors were there and it tasted spot on! Success! Combine all ingredients in a mason jar. Shake well to emulsify. Pour some dressing over salad and sprinkle with more Sesame Seeds and serve. © 2018 MJ. All Rights Reversed.